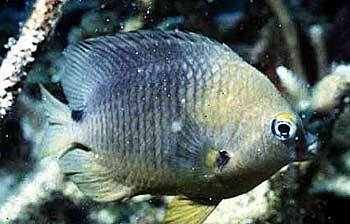 The dusky damselfish is a non-migratory, reef associated species that ranges from Florida to Venezuela. Age at maturity and maximum age are estimated at 1.5 and 5.5 years, respectively. Spawning may occur throughout the year and has been reported in January, June, and September. Juveniles often occupy the same habitat as adults but appear markedly different in coloration; displaying red-orange fading to a dullish blue in contrast to the dark olive-brown adult coloration. Males are highly territorial and will vigorously defend an established territory, especially an active nest. Chasing and producing sounds such as “chirping” and “popping” at intruders are the weapons of choice for damselfish.Male damselfish produce pulsed sounds during courtship and aggressive behaviors, while females appear to only produce sound associated with aggression. The swim bladder is the mechanism for sound production in both sexes.